Figuring out how to pay for college can, at times, be a bit complicated. There are a lot of factors that go into the process. However, there is also a lot you can do to make it easier. There are many resources available to Minnesota residents to simplify the process of paying for college. There are different options such as federal, state, and private funding. Are you ready to embark on your college journey? Then let’s talk about the four steps all Minnesota residents should take to fund their college education. Every student’s first step in the financial aid process is filling out the FAFSA. FAFSA stands for Free Application for Federal Student Aid. The FAFSA can seem a bit overwhelming at first, but it is necessary for any student looking to get aid. Filling out the FAFSA might not be super enjoyable, but it has many benefits. After filling it out, you will automatically be qualified for some forms of aid such as federal grants, federal subsidized and unsubsidized loans, and some state grants. Because FAFSA can be tricky, you might want to check out our step-by-step guide that will walk you through every question on the form. The sooner you fill out the FAFSA, the better. Some grants might have application deadlines that you don’t want to miss. Keep in mind that you can fill out the FAFSA even before you know which school you’ll be attending. As we mentioned in step one, just filling out the FAFSA automatically qualifies you for some grants and scholarships, but not all. You will find out what aid you qualify for when you receive your financial aid letters from the schools you applied to. They will have looked at your FAFSA and automatically qualified you for certain state programs that are available to you. You can also do some research on your own to see what other state programs might be available. To begin your search on state funding, you may want to browse the Minnesota Office of Higher Education website. Click on their “paying for college” tab to find lots of useful information about funding your education. This website offers helpful insight to Minnesota residents regarding different forms of funding such as grants, scholarships, work study employment, and more. Minnesota State Grants for students from low- and moderate-income families to pay for educational expenses at eligible Minnesota colleges and universities. The Post-secondary Child Care Grant Program helps low-income students who have young children pay for childcare while they attend classes. MnSCU Two-Year Occupational Grant Pilot Program for students enrolled in qualifying career and technical programs at two-year colleges in the Minnesota State Colleges and Universities System (MnSCU). This program helps students complete their academic programs in two years or less and find employment in high-demand occupations. Federal Grants for Aspiring Teachers (TEACH Grant program) for students who intend to teach in schools that serve students from low-income families. Other Minnesota grants can be found here. Along with grants, Minnesota offers a number of scholarships for residents. Minnesota Indian Scholarship for Minnesota residents who are of one-fourth or more Indian ancestry. Minnesota Academic Excellence Scholarship for students who have demonstrated outstanding ability, achievement, and potential in one of several subjects: English or creative writing, fine arts, foreign language, math, science, or social science. More information about Minnesota scholarships can be found here. If you’re a high school student, be sure to regularly check in with your guidance counselor so you can stay up to date with any local scholarships that may be available to you. For a list of scholarships offered through Minnesota institutions, click here and scroll until you find the school you’re looking for. You can also check out the websites of Minnesota colleges or call their financial aid offices to get more information. Another option is to do your own searches online. There are lots of scholarships available, you just have to find them. You can search online by major, religious affiliation, sports you may participate in, etc. CollegeScholarships.com has a variety of scholarships available to Minnesota residents. Another great resource for scholarship hunting is Sallie Mae's Scholarship Search. This database is constantly updated with new offerings. Big Future by College Board is also a helpful scholarship resource. There, you can find scholarships and other forms of aid from over 2,200 different programs. Besides just scholarships, Big Future can also be a useful resource in picking a major or even finding a career. If you’ve gone through all your options for grants, scholarships, and federal loans, a private loan can bridge the gap for the remaining funds that you’ll need. Before taking out a Minnesota private loan, check out our free NitroScore tool. 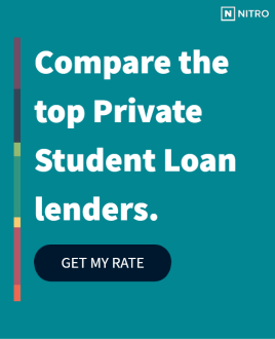 It can help you decide if a private student loan is right for you. It’s very simple to use. Just enter a college and major, and the tool will tell you your total cost of education. In addition, the tool will lay out your salary after graduation and predict how much of your salary per month will go towards paying off your student loans. From there, you’ll receive a score that represents how easy or difficult it might be to repay your loans. You can customize the results of the score with different factors such as scholarships, grants, and savings. You can even compare different major and school combinations. After utilizing the NitroScore tool, check out which of our highly trusted loan partners can give you the best rate. Thanks to all the resources available, funding your college education is an attainable goal for Minnesota residents. You can’t start the process too soon, so start planning for college today.